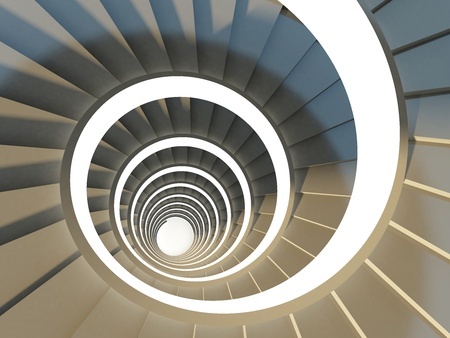 Interior and exterior spiral staircases add architectural interest and aesthetic appeal to a space. A whimsical and space-saving design, spiral staircases offer new access to tough-to-reach spots in the home, easily adaptable to any size and type of space. Often performing arts halls include grand spiral staircases that awe performance-goers and add a touch of elegance to the experience. The Szczecin Philharmonic in Poland, went the extra mile and transformed their spiral staircase into a living, interactive entity. Using digital technology, media arts and design collective panGenerator modified the Philharmonic’s staircase, adding a 35m long and 15m high voice-changing instrument to the structure. Guests stand at the top of the staircase with a container of small balls and a microphone. They place one ball into the microphone opening, and record a vocal sample into the microphone. When the recording is finished, the microphone releases the ball to spiral down the staircase along the 35m-long track. As the ball falls, the sound the guest recorded seemingly follows the ball, creating a living instrument of sound with their voice recording. The ball then deposits into a container at the bottom of its trek. Along the track, infrared sensors record the speed and position of the ball to ensure synchronization between the recording and movement of the ball. Streaks of light amplify the experience as they follow the ball while it slides down the track. Created for the 2018 MDF Festival, the project is labeled SPIRALALALA, and encourages guests to experiment with various sound effects to achieve different experiences. Adding vibrant, people-created sounds to this staircase offers a unique way for people to interact with something typically inanimate. Custom designed spiral staircases can serve a variety of needs and purposes, plus, they are aesthetically pleasing. Contact Acadia Stairs today to start turning your idea into a reality.